Letterkenny General Hospital, Letterkenny, Co. Donegal, Ireland. *Address correspondence and reprints request to: Aaisha Khan, Letterkenny General Hospital, Letterkenny, Co. Donegal, Ireland. Khan A, Waqas S. An Unusual Diagnosis of Chest Pain. Oman Med J 2013 Nov; 28(6). We present a case of a 49 year-old woman having no significant past medical history with severe chest pain since 4 hours, global ST elevation in all ECG leads and raised troponin T. A diagnosis of acute STEMI was made and the patient was subsequently thrombolysed with intravenous tenecteplase. Her echocardiogram revealed septal akinesia and left apical ballooning. The coronary angiogram did not reveal significant stenosis in any artery. 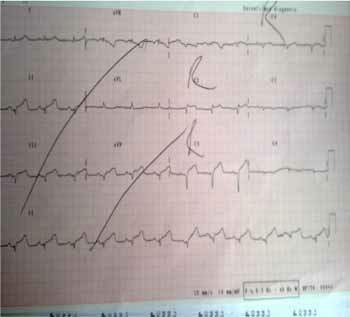 Figure 1: ECG with ST elevation in all the chest and limb leads. Figure 2: ST elevation on right side chest leads. 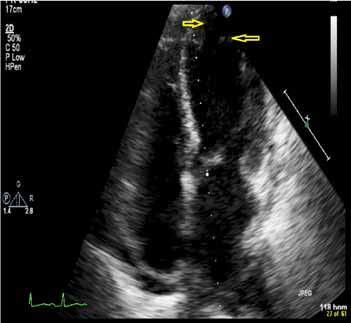 Figure 3: Echocardiogram showing left ventricle apical balloning. 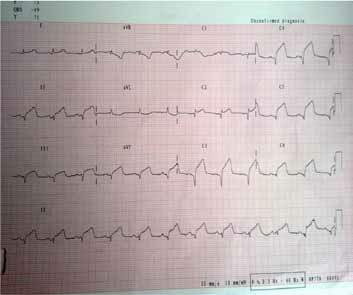 The patient was diagnosed with a condition called Takatsubo cardiomyopathy or stress cardiomyopathy. 1. Sharkey SW, Lesser JR, Maron BJ. Cardiology Patient Page. Takotsubo (stress) cardiomyopathy. Circulation 2011 Nov;124(18):e460-e462. 2. Derrick D. The "broken heart syndrome": understanding Takotsubo cardiomyopathy. Crit Care Nurse 2009 Feb;29(1):49-57, quiz 58. 3. Al-Busaidi Z, Bhargava K, Al-Ismaily A, Al-Lawati H, Al-Kindi R, Al-Shafaee M, et al. Prevalence of Depressive Symptoms among University Students in Oman. Oman Med J 2011 Jul;26(4):235-239. 4. Virani SS, Khan AN, Mendoza CE, Ferreira AC, de Marchena E. Takotsubo cardiomyopathy, or broken-heart syndrome. Tex Heart Inst J 2007;34(1):76-79.